Ladies and Gentlemen, may I present The Eagle's Nest's second ever giveaway. CSN has over two hundred online stores where you can find everything from nesting tables to fitness equipment to gourmet cookware. I love their All Modern boutique which features designers like Missoni and Thomas Paul. 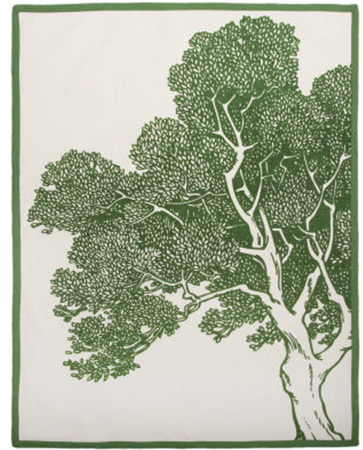 This week, CSN is partnering with the Eagle's Nest to give one lucky blog reader a Thomas Paul Tea Tree Dish Towel. Yeah yeah, it's a dish towel. It will get dirty if you clean your dishes with it. But why not use it in a creative way? You could stretch it over a canvas stretcher or mat and frame it and create some art.... or add a piece of cloth and a zipper to the back and create a throw pillow. The options are limitless. Comment back and let us know how you'd use it (it's ok to use it for its original purpose) and be entered to win. * Contest will be open until Midnight PST on Wednesday, October 13. Contest is open to US residents only. * The winner will be randomly selected and announced on this website on Friday, October 15. Please check back to see if you have won, or leave your email address with comment. The winner will need to contact jessadavis@gmail.com to provide name and shipping address.